April, 2016, Eindhoven – Advantech, a leading embedded computing solution provider, is pleased to announce successful collaboration with iDklic. iDklic wins a new network of 260 independent pharmacies in Belgium, all of them clients of the Belmedis group, Belgium’s second biggest wholesaler distributor. iDklic will operate the network as well as handle advertising sales on this project which launched on November 1st 2015, and which will see nearly all 260 pharmacies having to be equipped by June 1st 2016.
iDklic is a Brussels-based company specialized in digital media & signage at points of sales. Since 2006, it has focused the largest part of its activities in the pharmaceutical industry. The company’s expertise in this field is one of the many reasons why Belmedis chose to partner with iDklic. iDklic uses the digital signage OPS player of Advantech, the ARK-DS262. iDklic chose to co-work with Advantech due to Advantech’s local support, the longevity on theAdvantech signage product range and the proven stable of the hardware. PharmaSeen TV© was created specifically for the pharmacy market. 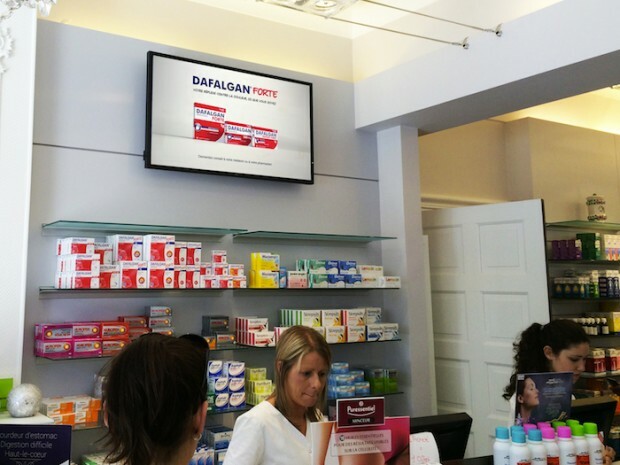 An international success, PharmaSeen TV© is deployed in over 1,300 Pharmacies across continental Europe and is now also in operation across 150 Irish pharmacies and 50 pharmacies in Luxembourg. With this unique channel, each pharmacist can operate and program his/her own screen via iDklic’s dedicated web-based platform. The pharmacist has access to a wide range of content (advertising, health-related thematics, customizable templates, weather forecast and much more) which enables him/her to fully personalize his playlist & promote his offers, events and specialties. Digital signage creates a vibrant and very dynamic communication platform as it’s been shown that OTC product sales increase significantly with itas digital screens clearly motivate people to purchase. Product advertising and health information are perceived by customers in a much more attractive way. Jean-Charles Figoni, iDklic’s CEO & Co-founder, confirms this statement by telling us “The PharmaSeen TV© entertains and informs healthcare consumers with relevant video content and advertising messages which encourage impulse purchases. Our business model corresponds perfectly to our clients’ expectations who are looking for a measurable return on investment.” The audience sees PharmaSeen TV© as informative and highly credible, whilst pharmacists say that advertising on their network drives action by encouraging consumers to talk to them about products they see on screens. Founded in 1983, Advantech is a leader in providing trusted, innovative products, services, and solutions. Advantech offers comprehensive system integration, hardware, software, customer-centric design services, embedded systems, automation products, and global logistics support. We cooperate closely with our partners to help provide complete solutions for a wide array of applications across a diverse range of industries. Our mission is to enable an intelligent planet with Automation and Embedded Computing products and solutions that empower the development of smarter working and living. With Advantech, there is no limit to the applications and innovations our products make possible. (Corporate Website: www.advantech.eu). iDklic is a leader in digital communication in the healthcare industry. Created in Brussels in march 2006, the company brings together a team of competent individuals specialised in the various fields of digital communication. Digital customer experience has become a key business differentiat. So to design truly unique experiences, iDklic seesno boundaries among platforms. Their team uses hardware, software, web & mobile elements, and interactive media, amongst others,to develop entirely new effective ways for people to creatively share and communicate in the points of sales. As an advertising sales agency,creative studio and technology partner, iDklic strives to deliver a superior digital experience. Corporate website: www.idklic.com).